MOSCOW, November 25. /TASS/. At least 100 people were injured as militants shelled residential districts of the Syrian city of Aleppo with chlorine-laden projectiles, the Al Mayadeen TV reported on Sunday. Earlier in the day, the state-run SANA news agency said extremist armed groups fired shells loaded with chlorine at Aleppo on Saturday evening. A police source told Syria TV that the shopping area on the Nil Street, where citizens were strolling in the evening, came under fire. Earlier, reports about a chlorine attack came from the neighborhoods of Al-Khalidiyah and Jamiyat al-Zahr. Initial reports said at least 15 people were hospitalized with breathing troubles. The previous update said 60 people were affected, including three children. Aleppo Health Directorate Chief Ziad Haj Taha said many lives were saved by Syrian servicemen, who promptly delivered victims to hospitals. "So far, no one was discharged from hospital. Doctors continue treating those affected," he said. "The condition of two teenagers, who were earlier admitted to intensive care, has stabilized." Aleppo Police Chief Maj. Gen Issam al-Shibli earlier blamed the attack on terrorists from the Jabhat Al-Nusra terrorist group (outlawed in Russia). He said the militants launched projectiles at city districts close to their positions. Artillery units of the Syrian armed forces shelled positions held by militants on Saturday night, the state-run Syria TV reported. According to the channel, many militants were killed or injured in the attack. 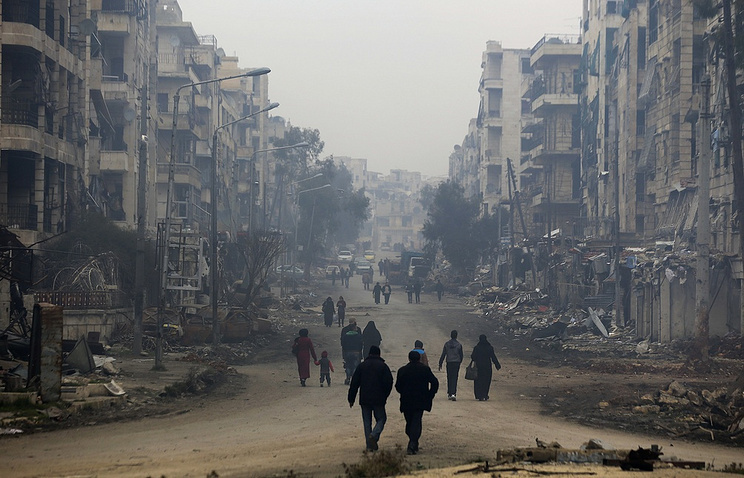 On Thursday, militant groups shelled western outskirts of Aleppo, injuring five civilians.